This is a fairly unusual scene, seeing ostriches so close to the water’s edge. The shot was taken on a hot and still summer’s day, and there they were cooling down on the wet sand. While currently our winter weather is set in and the nor’ westerly storms hammer the coast, oh! we dream of ‘Summer Lovin’ ….. this week’s photo challenge! Adorable photo. 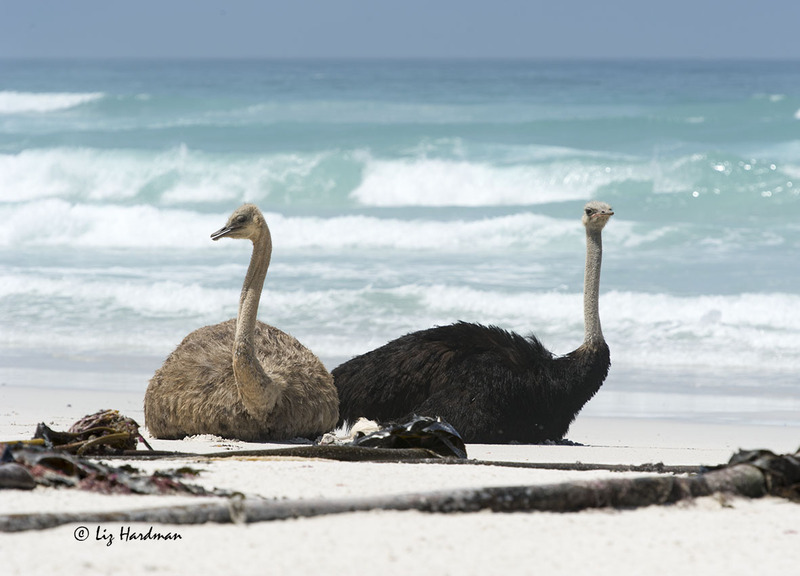 I photographed ostriches down at the Cape of Good Hope – the closest I have seen them by the sea. Which beach is this? Next time you go to Iceland, smuggle my camera and me, in your suitcase! Let me get my magic wand…..
🙂 … ’tis Mr and Mrs… you’ve picked the right temperament too! Never know what we’ll spot next … i expect perhaps the ostriches could take to paddling along the water’s edge?! Oh my, never in my wildest dreams would I imagine ostriches on beaches!